This month, it’s finally time to play the music and light the lights, with the release of The Muppets, a brand new film featuring Kermit The Frog, Miss Piggy, Fozzie Bear, The Great Gonzo and just about all of Jim Henson’s furry, felt-covered creations in an all-new story co-written by fabulous funnyman and human co-star Jason Segel (star of TV’s How I Met Your Mother and co-writer and star of Forgetting Sarah Marshall). The film, which sees the Muppet gang reunite after years out of the limelight to save their old theatre, is unquestionably one of the major motion picture events of the year, bringing the characters back to a generation that hasn’t had many opportunities to catch them in film or television (the last theatrical venture was 1999’s commercially disappointing Muppets from Space). But more excitingly, it is a great movie. Segel and Nicholas Stoller’s script strikes the perfect balance between unabashed appreciation for the characters and accessible, tasteful humor for modern-day kids and their parents. It wouldn’t be out of place to imagine the dearly departed Henson appreciating its simple, timeless message of the power of friendship and laughter in the face of a pop-cultural landscape that too often dabbles in cynicism and irony. And the music! Longtime fans will appreciate the appearance of some of the most famous Muppet tunes in the new film, but the new songs, most of them written by Bret McKenzie – best known as half of the comedy-folk duo Flight of the Conchords – possess exactly the kind of spirit you’d want from a Muppet movie. (In particular, “Life’s a Happy Song” is destined to score more than a few trips to the Disney parks.) Indeed, music has been an integral part of Muppetology since the very beginning: from the inescapable theme from Sesame Street to the endearing kitchen-sink/music hall playlists of each episode of The Muppet Show (often sprinkled with a dash of endearing originals, like Joe Raposo’s “Bein’ Green”). It’s in that spirit that we present this weekend’s Friday Feature, which showcases the soundtracks of those first three Muppet movies which set the template for this great new one. All of them have some wonderfully captivating songs (and stories behind songs) as well as – what else? – checkered histories on CD. So for the lovers, the dreamers and you: this is our tribute to Muppet movie music, and it starts after the jump. With the release of The Muppet Movie, fans were treated to some burning questions of the Muppet mythology. How did Kermit become a star? How did he meet up with his crazy gang of performers? Can he adequately ride a bicycle? All these and more were answered, with some killer songs, to boot. Chief among those killer songs was “Rainbow Connection,” the film’s opening number, played by a pensive Kermit strumming a banjo in the swamp. Fans of The Muppet Show had an iconic, eminently unforgettable tune to greet them with each episode, and The Muppet Movie was no different. The song, written by Muppet mainstay Paul Williams and Kenny Ascher, was intended by the composers to evoke the sentiments of “When You Wish Upon a Star” from Walt Disney’s Pinocchio – an infinitely upbeat declaration of believing in a dream. It’s easily become musical shorthand for Henson’s vision as the Pinocchio theme did for Disney, and it earned a multitude of plaudits, from a Top 30 placement on the Billboard Hot 100, a Golden Globe and an Oscar nod (one of two for the film, the other being for original score). But that wasn’t the only great song. “Movin’ Right Along” is a killer, upbeat tune that epitomizes the travelogue that drives (no pun intended) much of the movie. “Can You Picture That” is a solid rocker by everyone’s favorite felt rock band, Dr. Teeth and The Electric Mayhem. And “I’m Going to Go Back There Someday,” a plaintive ballad sung by The Great Gonzo, still stands as one of Williams’ favorites. All of these tunes more than justified the album’s platinum status. The success of The Muppet Movie made a sequel inevitable, particularly after The Muppet Show left the airwaves in 1981. (It departed not due to failing ratings, but Henson’s decision to focus on films full-time.) Henson actually went behind the camera for this tale about a set of twin newspaper reporters (Kermit and Fozzie, naturally) following a story about a jewel heist in London. For this installment, the songs were all written by Joe Raposo, whose association with Henson stretched back a decade and change to not only the theme song to Sesame Street but the unforgettable “C is for Cookie.” Though there wasn’t a breakaway hit like “Rainbow Connection,” tunes like “Happiness Hotel” and the romantic “The First Time It Happens” (an Oscar nominee for Best Song) are fitting entries in the Muppet canon. 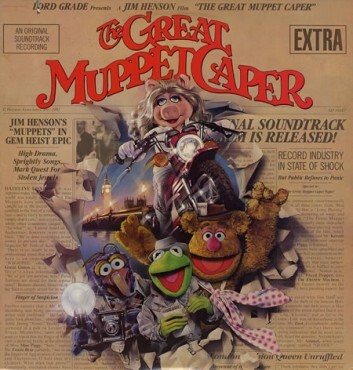 Alongside the Muppet Movie soundtrack CD, the original soundtrack to The Great Muppet Caper was released in 1993. Three of its tracks – “Hey a Movie!,” “Happiness Hotel” and “The First Time It Happens” – were included on the Rhino compilation as well. Interestingly enough, this is the only one of the Henson-era Muppet soundtracks that remains unreleased on CD, although “Together Again,” “I’m Gonna Always Love You” and “He’ll Make Me Happy” made their debuts on the format on the aforementioned Rhino compilation. The biggest problem with the Henson releases is that they were available for around about a week – at least that’s how it seemed. They are all quite hard to find now. A re-issue of all three soundtracks along with the three Muppet Show albums The ultra rare “Old Brown Ears is Back” and the Music Hall EP are well overdue. Reissues of those albums would be very cool indeed, as would getting the rest of the Muppet Show seasons out on DVD. And blu-ray releases for the movies that Disney owns (Muppet Movie, Muppet Caper, Christmas Carol, Treasure Island) too. Then there’s the checkered history of holiday titles like Emmett Otter, Muppet Family Christmas, and The Christmas Toy, all of which have been edited down in video/DVD releases in part due to music rights, in part due to who owns what characters now. Let’s not forget John Denver and The Muppets either, which has been available on CD but I don’t think it’s ever been legitimately released in any sort of video format. And these shows never seem to pop up on TV anymore either. A shame that these classics are more or less lost and collecting dust in a vault somewhere. I saw “The Muppets” today and just loved it. Fun, funny, and Jason Segel got it right. I hope it’s a big hit, and I hope it’ll cause Disney, or whomever holds the rights to the aforementioned shows/movies/soundtracks, to reissue this stuff. This movie would of been a perfect time to rerelease these albums either as CDs or DD, either way I would of bought them. The rhino set is okay, but missing the great Gonzo ballad from the Muppet Movie. Rhino has the version from Muppets From Space. I also wish someone would reissue the soundtracks to the first two seasons of the show. I actually never found a copy of 2, but loved the first one as a kid. Was a good balance of music and skits.